You want action? Take a look at this guy Tobias S. Buckell, a Grenadian-born New York Times bestselling author, with 7 novels and over 50 short stories to his credit. Violence is his stock in trade, whether its alien Aztec gods beating seven bells out of Caribbean space-faring settlers on a far-off world, or technothriller spy stories where ex-intelligence operatives find themselves battling over the fate of superweapons that could destroy the planet. He's on the New York Times bestseller list and has been nominated for the Hugo, Nebula, Prometheus and John W. Campbell Award for Best New Science Fiction author. He's also a huge video game fan who goes nuts for Halo and Skyrm; veteran fans of the Halo franchise may already have one of his books on their shelves, The Cole Protocol. 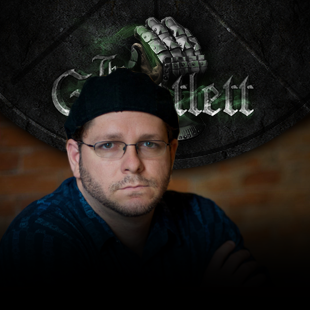 I was fortunate enough to be able to sit down with the gentleman and interview him for the Escapist. Here's what he had to say. Adam Gauntlett: The Writers of the Future competition, which you won in 2000, was an important first step in your career. Can you describe what that meant to you? Tobias Buckell: It was really exciting! I first encountered the anthology when I was 13 and living in the Virgin Islands. They had the instructions on how to submit and send stories in right on the back. At the time I didn't even know how to submit a manuscript; this how I found out what to do. I didn't even know the addresses of other magazines to submit to until many years later, when I was in the States and found the Short Story Writer's Guide. The Writers of the Future was the first market I tried to break into. I got rejected quite a lot! I think I submitted almost every quarter for six years, until I finally got published when I was 19, with In Orbite Medievali. Gauntlett: What kept you going? Buckell: It just became a habit. I wanted to become a working writer, so I became obsessed with Writers of the Future. I kept at it, and kept at it, and kept at it. High school was a long time ago, and I don't remember all of it, but I do remember in college reading about how many rejections other authors endured before they succeeded. That gave me the encouragement to soldier on! Buckell: It was fantastic! Sometimes in life you get times when you can bring things full circle, and that was one of them. It was the first place I'd submitted, so to finally sell it a story after all those years of trying just felt wonderful. In Orbite Medievali was a story I wrote while I was at Clarion, a six week long workshop for Science Fiction and Fantasy writers, so I was really excited both to sell a story from Clarion and to finally crack Writers of the Future, something I'd been trying to do for years and years and years. Cool! Gauntlett: Let's talk Halo. You wrote a tie-in novel, The Cole Protocol. How did that happen? When I flew out to meet them and talk about some of the ideas I had, it quickly became clear that I'd played all three titles all the way through, and was very familiar with the universe. I didn't need to be brought up to speed or anything! Gauntlett: Which was your favorite Halo title? Buckell: I really liked Halo 3 because that's the first one I played. I picked it up when I got an Xbox 360, and I think it came with the console. I played through Halo 3 and then I went back and played Halo: Combat Evolved and Halo 2. I liked the storytelling in Halo 2; Halo 3 had some great sense-of-wonder moments that were really cool, but because I hadn't played the previous titles I spent a lot of time being confused, even though I was having a lot of fun!